How important is the issue of child recruitment for your division? This issue is a preoccupation for us every day, as there are many children in the DRC who are at risk of recruitment, and there are many families and communities affected by this plague. In fact, since this day underlines the adoption of the protocol relative to the convention of the Rights of Children, the countries who have signed this will benefit from this day to show what they are doing, according to their obligations with regard to the protocol. Apart from the DDR programme, does the Child Protection Division work with other organisations such as UNICEF, to monitor these children in terms of reintegration? Firstly the Disarmament Demobilisation and Reintegration (DDR) programme is a national plan, and MONUC, as well as other organisations, contribute in several ways to ensure its success. As you know, MONUC cannot do everything alone and it needs also to cooperate and work in synergy with the institutions in place and the organisations dedicated to child protection. Regarding children associated with armed forces and groups, since the beginning of the mission in the DRC, MONUC has contributed with the facilitation of access to inaccessible zones where children were present in armed groups or were at risk of recruitment. Does MONUC play an active role in ending child recruitment? MONUC played an active role by denouncing the presence of children in armed groups, and by encouraging the communities and state institutions to protect children against recruitment. Of course, we work with UNICEF which is a United Nations agency dedicated to the protection of the child in the UN system. With the deployment of a considerable force, MONUC Blue Helmets can also contribute to putting an end to recruitment, while being alert to numbers of children present in sectors where armed groups are present. They can also sensitise the population, children and armed groups of the dangers of child recruitment, and the sanctions which will be applied against those which recruit. MONUC produced several reports to the UN Security Council, denouncing the recruitment and presence of children within armed forces and groups in the DRC. These reports were supported by advocacy pleas from Congolese state institutions as well as civil society leaders. The combined intervention of MONUC, UNICEF and national and international NGO's as part of the national DDR programme made it possible to release up to 30,000 children from armed groups in the DRC. The majority of these boys and girls profited from programmes and aid to return to their families and restart normal civilian life. However, we believe that several children simply returned by themselves, and used their natural resilience to restart a more normal life, and were able somehow absorb the inevitable after-effects of a childhood spent in combat for an active military group. Last year an act of engagement was signed in Paris by countries involved in the issue of children associated with armed groups. 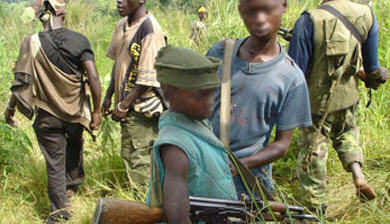 Did MONUC reaffirm its intention to support the DRC in ending child recruitment? Firstly, the recruitment of children will be always illegal. There are no conditions which make child recruitment legal. Before the protocol and Principles of Paris, the use of children for war activities was already prohibited by the Geneva conventions, which lay down the rules of war combatants precisely, and prohibit the use of people of less than 15 years of age for military activities. MONUC's Child Protection Division ensures that the personnel of the mission, both civilian and military, understands and respects the applicable principles of the protection of children in a peacekeeping mission. We also try to support the government and its institutions with recommendations relating to all the elements which relate, in any way, to the protection of children against recruitment. Thus, MONUC's Child Protection Division brings its support for the reform of the laws and legal instruments involved with putting an end to recruitment, to encourage an end of impunity, and to ensure that children who underwent recruitment profit from favorable conditions for rehabilitation back into their communities and civilian life. MONUC can also intervene with the armed groups and decision makers, political leaders and soldiers in the various communities, in order to prevent recruitment and to obtain the release of those who unfortunately were recruited. Children associated with these groups should be treated by the courts in accordance with the international standards for minors. Is child protection considered within a framework of the DRC justice sector reform ? It is generally understood that a child, even if recruited voluntarily, is initially a victim and that the legal processes must take account of this. Too much often the military jurisdictions arrest children suspected of having belonged to an armed group, and forget to arrest the recruiter who is responsible for a serious violation of children's rights, and sometimes even war crimes. In the majority of countries, the military jurisdictions do not have any authority with regard to minors, and it's the case here in the DRC. Do you have a particular message to make on this day? It would be for all those concerned or upset by the issue of children associated with armed groups to transform their interest into concrete support in order that child recruitment for war disappears from the planet. The national and international NGOs should intervene more quickly when conditions for child recruitment are visible or developing. They are the same everywhere, and it would be possible to intervene more rapidly to act on these conditions and to prevent recruitment. Prevention would be much less expensive from all points of view and would undoubtedly have a significant impact on the prevention of conflict.